Where do I start? I have so many books calling out to me! Do you love books as much as I do? My mom is a varocious reader. My mom loves history, biographies and detective series.You know the 800 page David McCullough masterpieces of 1776, John Adams, and The Great Bridge, the building of the Brooklyn Bridge? She breezes right through these. Lee Child’s Jack Reacher and Tony Hillerman’s Navahoe Mysteries? Yup, she has read every one in those series too. I love to read too. Although we might not always have the same favorites, she definately gave me the love for books. So here is a small stack I have on my table waiting for me to open their pages. It is quite the variety. 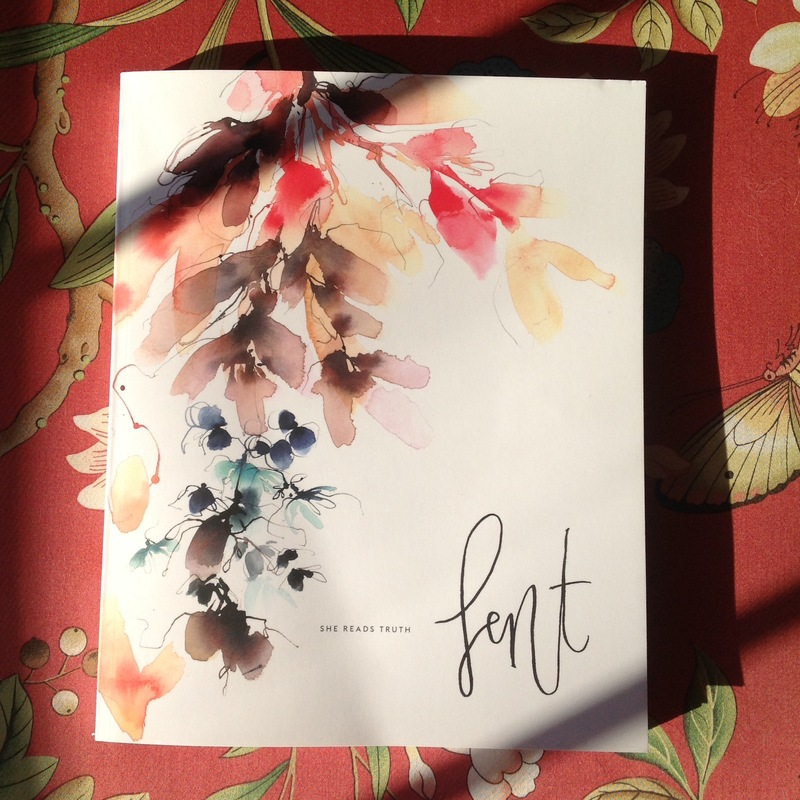 First up is Lent by She Reads Truth. 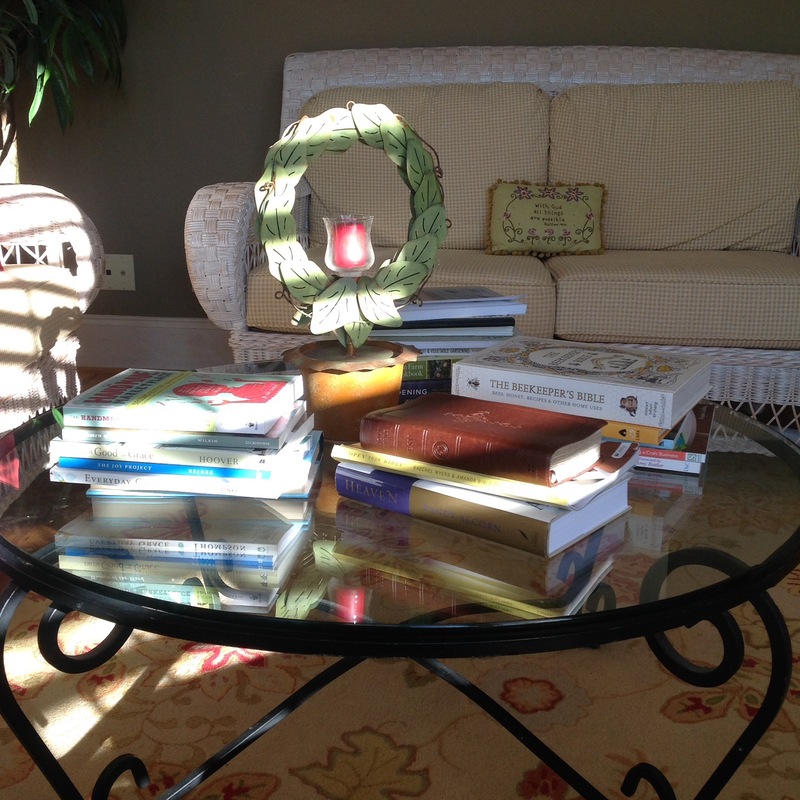 I love their beautiful books, cards, pictures, and daily readings. 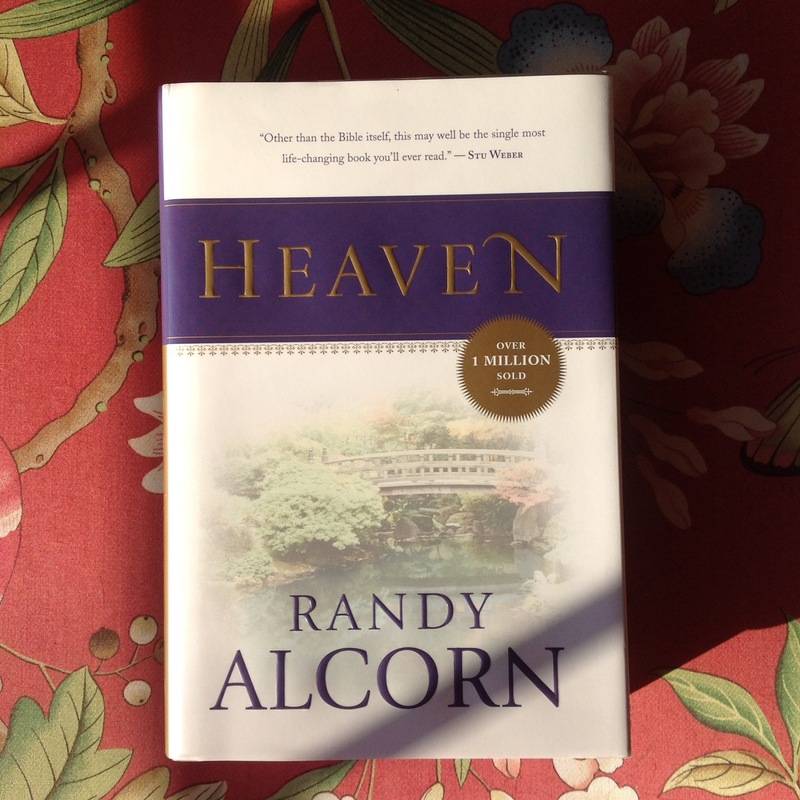 This book has led me through Lent with daily scripture readings and hymns along the way. 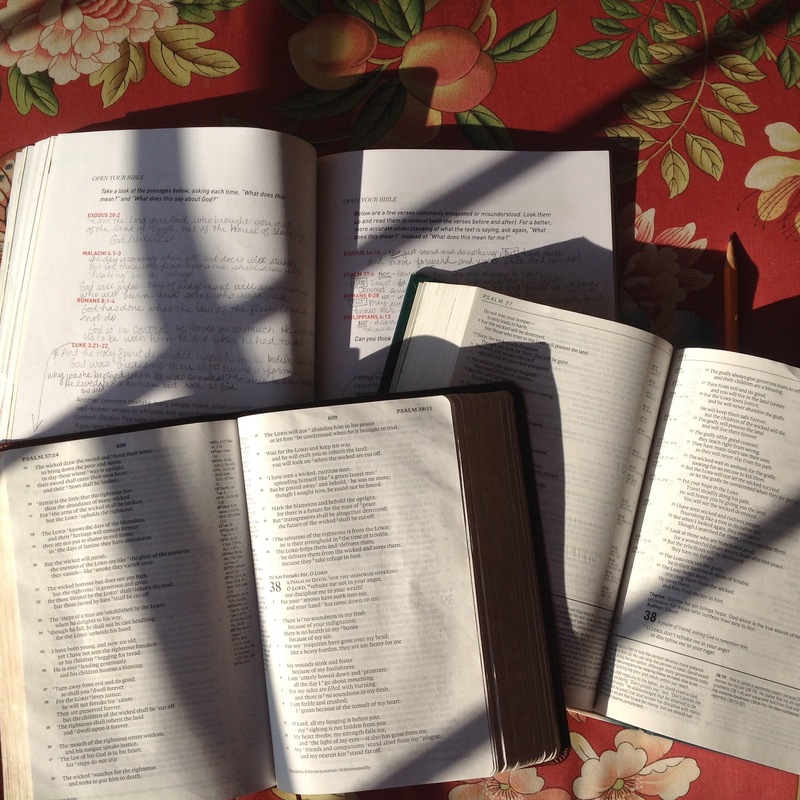 Next comes another study written by the ladies at She Reads Truth, Open Your Bible. I’m going through this eight week study with a dozen women in my home on Wednesday nights. The authors have given us this picture of a tree (the bible) that gives us food (spiritually), shelter, rest, wisdom, correction and hope. We all are given the invitation to climb this tree with its roots grounded deep in the soil and with limbs that reach out and high. This tree allows us to reach up to someone on a higher limb to seek help and wisdom and also to lean down to pull someone up. No matter where we are on this tree, whether just approaching the tree, climbing its branches or resting in its cover, it is for us, you and me, here and now. I’m sad to say that this Wednesdwill be our last gathering until next time. Bees, you ask? Yup! Superman and I won a bee hive at a silent auction fundraiser this past fall. We thought it would be a great addition to the many fruit trees and grape vines we’ve planted at the farm. I’m quite excited to learning more. 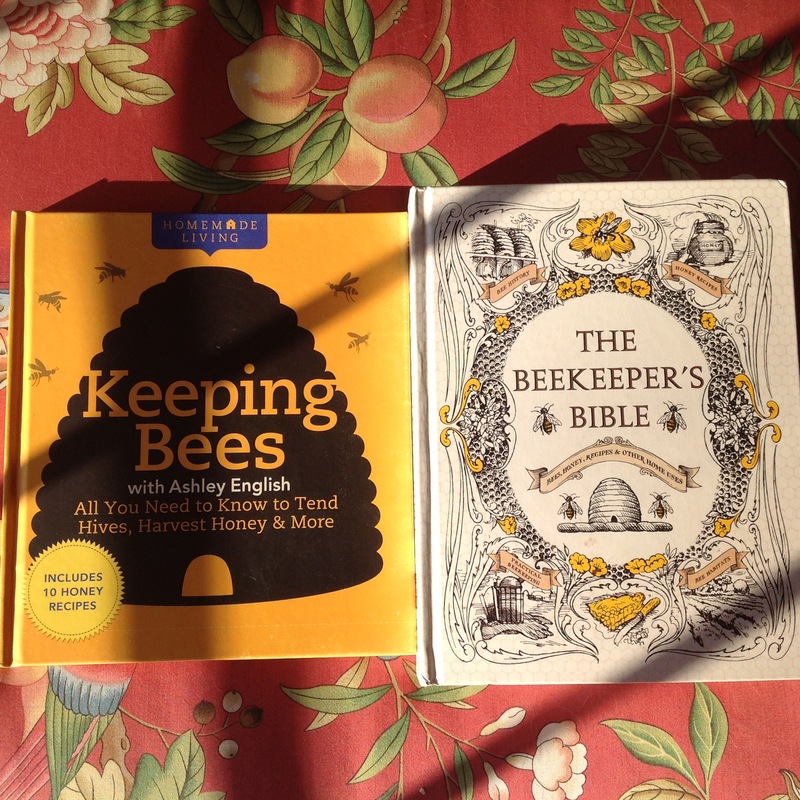 I’ll definately write about our adventures in beekeeping! Oh my goodness. These four books are not very long in pages, but are making a huge impact in my thinking. 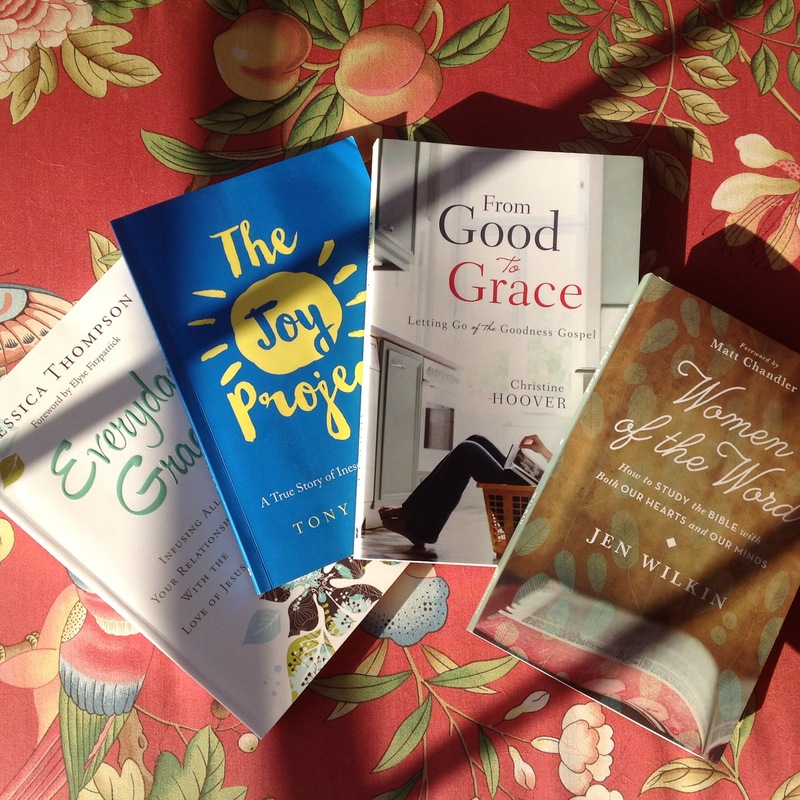 Everyday Grace, by Jessica Thompson is reminding me “how to form strong, resilient bonds with people who, like me, are bound to mess up.” Tony Reinke a staff writer for DesiringGod.org wrote The Joy Project. The cover of the book says “A true story of inescapable happiness.” Doesn’t that sound wonderful? Joy isn’t something we search for or create or even plan for. Joy was created before we took our first breath. It is in our DNA. Our hearts and souls were created for joy. Unfortunately we’ve put a big wet blanket over it with fear, self doubt and worldly ambition. I want that overwhelming light of joy to shine brightly. I want it.From Good to Grace, by Christine Hoover is a book I need to read over and over again. I so often feel like I’m not good enough. I try so hard to be a good wife, good mother, good daughter, good friend “hoping for that ‘atta-girl’ from God, some heavenly assertion that I matter. In the process, I find myself living by a lesser Gospel: the gospel of goodness. It’s a gospel without grace and in the end, it’s good for nothing. 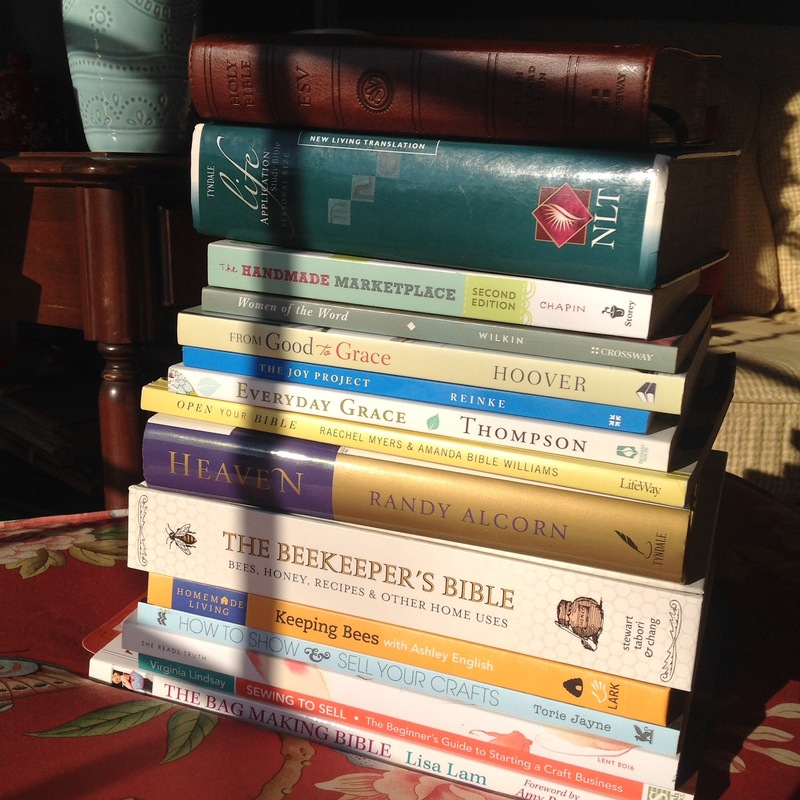 Hoover helps us to start asking ” What does God want for me?” Instead of “What does God want from me?” The last book in this stack, which I really want to start is by Jen Wilken, Women of the Word. The bible is to be read intellectually and emotionally. This book hopefully will teach me how to study the bible with both my mind and my heart. Yea. 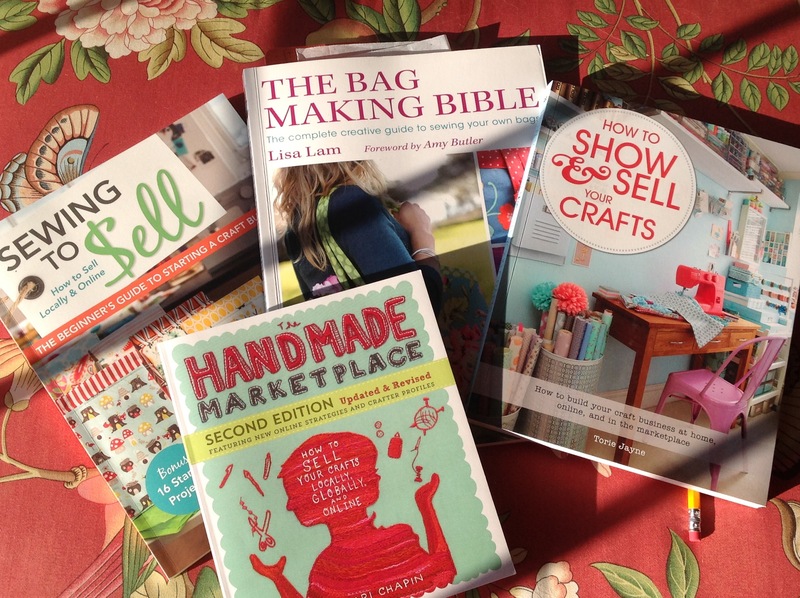 You knew I had to be reading something about crafts. It sounds crazy, but I really think I’m suppose to be selling my stuff. I’m a newborn crying baby just out of the womb with this whole selling business. I have no idea about anything, but I’m willing to learn, take a few chances and give it a go. I have another craft show I’m doing in a couple of weeks. I’ll let you know how it went. Again, I’d love to be able to use this passion I have for creating to help others in their missions. 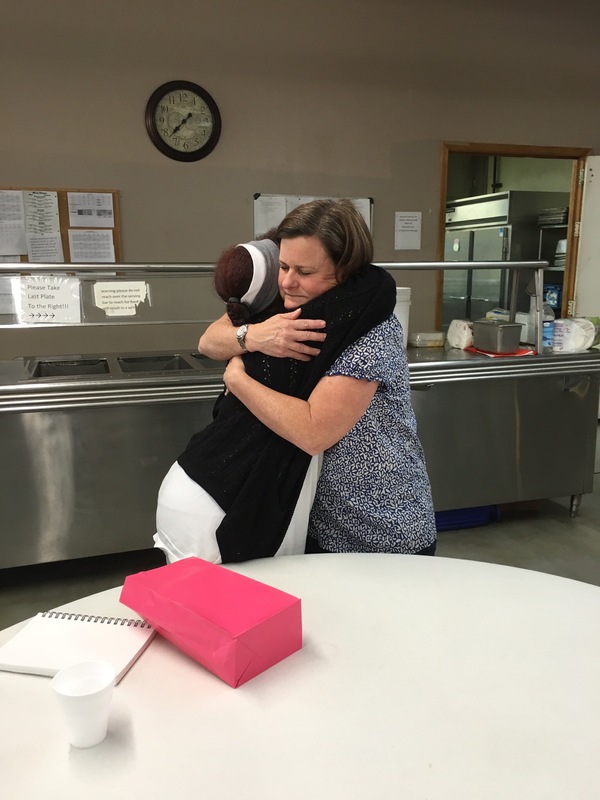 Last time I was able to give over $200 to a small nonprofit here in town that teaches English to immigrants, helps them assimilate to the area and shares the gospel. This is a heavy one. As a Christian I must know. I’ve read the first few chapters and couldn’t put it down. I need many hours of quiet concentration to get every little bit. 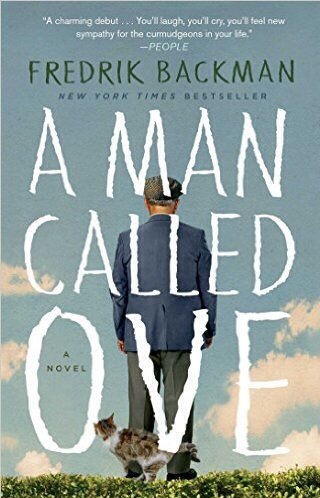 The book club I’m in discussed this quirky book, A Man Called Ove, by Fredrik Backman. It touches all of our emotions: sadness, happy, laughter and sympathy. I loved it. 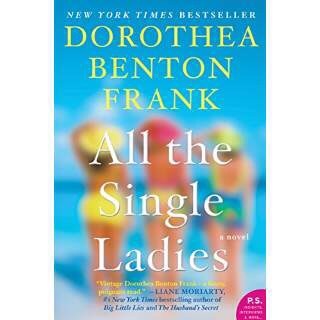 This months read is, All the Single Ladies, by Dorothea Benton Frank. I have to say that this may not have been my most favorite of hers, but I always enjoy a book set in my favorite city, Charleston. It’s a story that didn’t seem to take much imagination for the writer. But on the whole it was an enjoyable, easy read. With all the yuck going on in the world, sometimes I just like nice and easy. 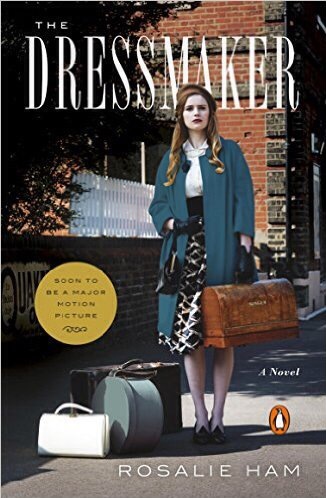 At night I’ve been curling up with this gem of a book, The Dressmaker, by Rosalie Ham. Set in a small town in Australia, Tilly comes home to take care of her mother, Mad Molly. The townspeople with all of their crazy personalities is making this a funny read. I’m looking forward to watching it on the big screen! Anyone want to go with me? With all these books, is there any wonder why the laundry is piled high? Oh well, I’ll get to it at the end of this next chapter….heehee. 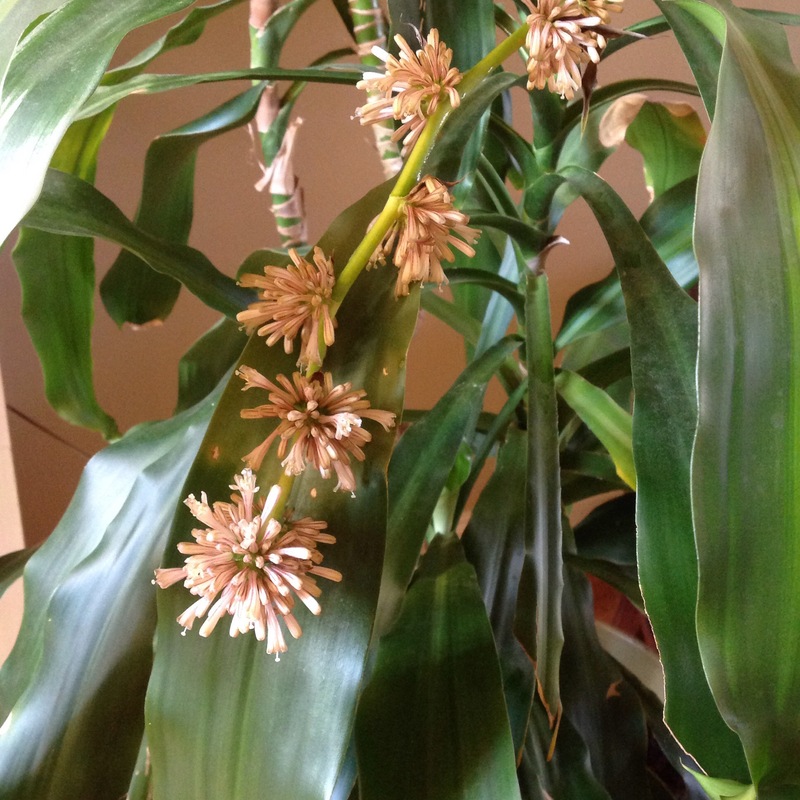 Meanwhile back at the ranch….I have this corn plant that has been sitting in the corner of my living room for nine years. Only because that sideways watering can is there, does it ever get watered. I’ll see the can every so often and am reminded to give the old girl some water. Now, twice a year I will roll her out the front door to wash her down and get the layer of dust off of her. Oh yeah, call me Little Miss Green Thumb. It sits in the corner, gets random watering and almost no sunshine. 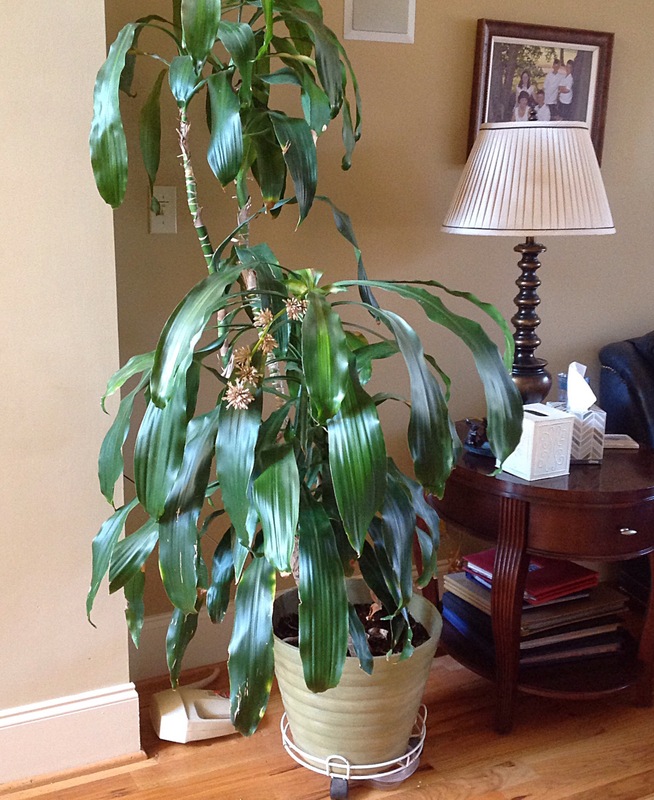 The plant is almost six feet tall and probably needs to be replanted in a bigger pot. I have to admit that on the day I brought it back inside, we noticed these green nodule things growing from it. We had no idea what it was. We had never seen anything like it on this plant before. So here we were, days later and these beautiful flowers were blooming! The very interesting thing about all of this, (as if just blooming for the first time in nine years wasn’t enough to knock your socks off), the flower only opened up and spread its perfume at night! 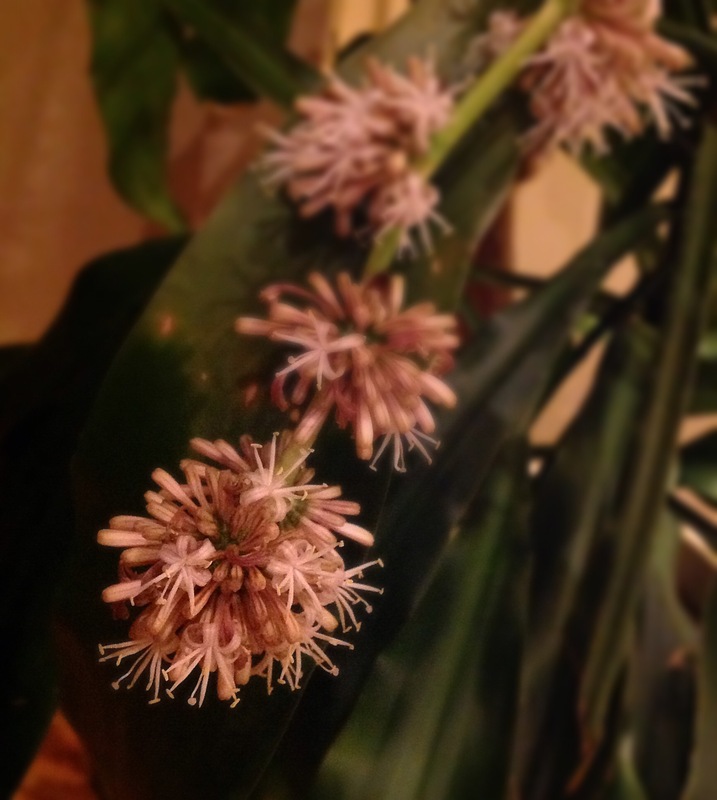 Lookie here….in this picture above that I took in the morning, the petals are closed. Here at night…open and full of fragrance. I was blown away by this event. Really I was! I went to my IPad and asked ‘The Google’. 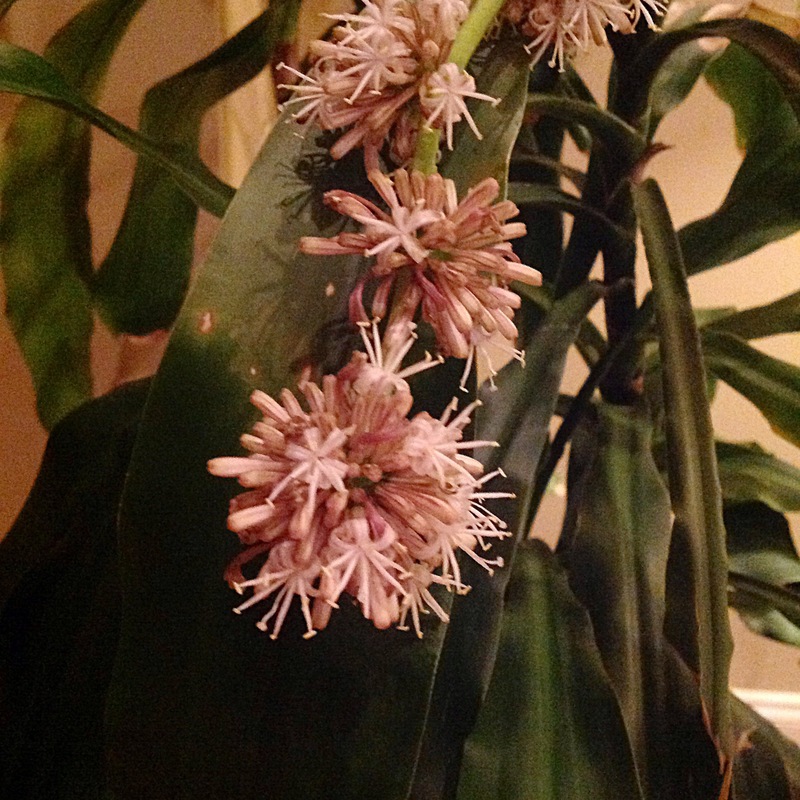 It said that one would rarely see this plant bloom indoors, possible but very rare. Huh! Of course this got me all a thinking about the week I had been having. It was a very busy one. One that left me not feeling so great about myself. 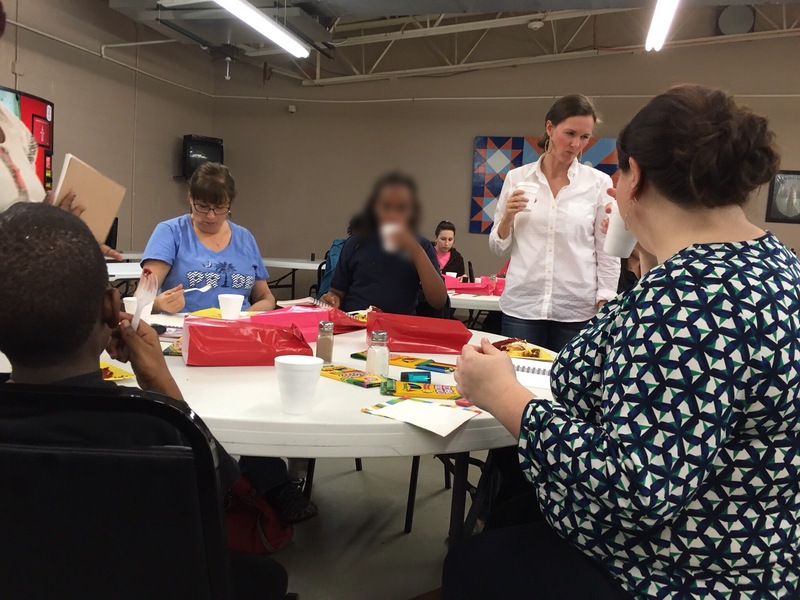 For example, on Tuesday night I led a Praying in Color workshop at Miracle Hill, Spartanburg’s homeless shelter. Ladies from my church joined the ladies at the mission for coffee, dessert and some doodling. 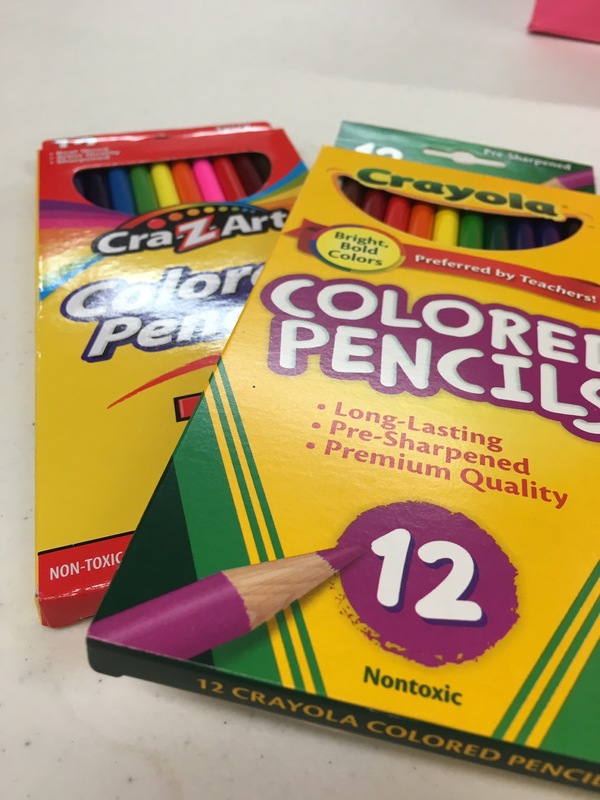 Bags were filled with a drawing journal, colored pencils, an eraser and pencil sharpener for each of the women at the shelter to keep. I prepared the flip chart with examples to show the girls. I made an orange cake that afternoon. But then things went down from there. I was late. I forgot the cord to the coffee pot. I forgot my notes. What I thought would take 45-60 minutes took 30 minutes. Can you hear the crickets chirping?……….and why are my eyes closed? What exactly is Praying in Color, you may be wondering? In a quick definition, it is praying through lines, doodles and color. It is just another way to clear our minds in order to talk and listen to God. It isn’t about drawing a piece for a museum, but using the simple tools of a pencil and colored pencils or crayons or markers to focus on a person, bible verse or concern. Needless to say, at the end of the evening I felt like a complete failure. I had forgotten some key elements I wanted to share. There wasn’t as much sharing as I had hoped . I knew for sure I had bombed. I was so spastic and felt uncreative. During the bible study that morning, one of the ladies said she wanted to show me something. 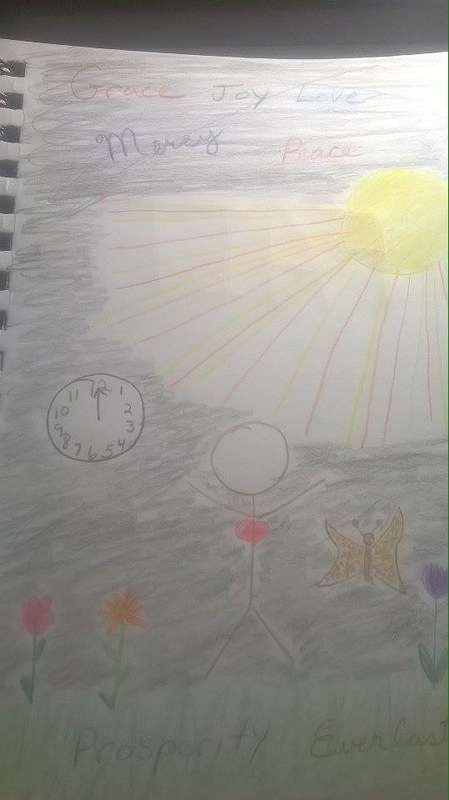 This is her picture,above, that she drew during her quiet time with God. She said she felt such peace while she was drawing. Wow. Again my assumptions got the best of me. 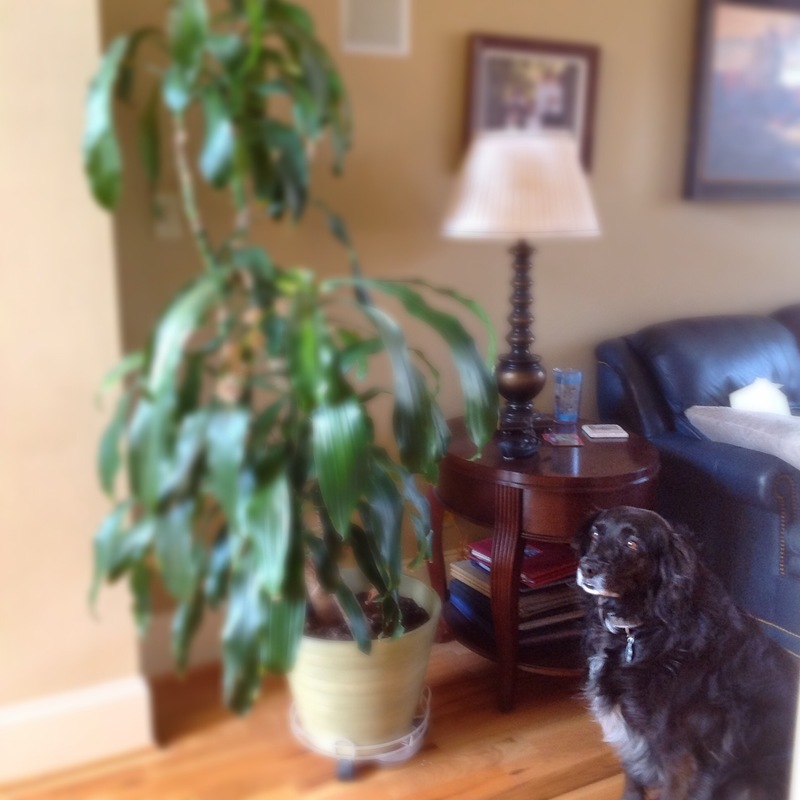 I assumed I was a certified plant killer. But as I researched this corn plant, it likes irregular watering, low light and to be pot bound. When things didn’t work out the way I, Me, Myself, Mary wanted, I figured it was a failure. But as I am learning, I see that it isn’t about the way I see it, but the way God sees it. I did what he wanted me to do. I helped organize and plan an evening that would help women discover a different way to be with Him. 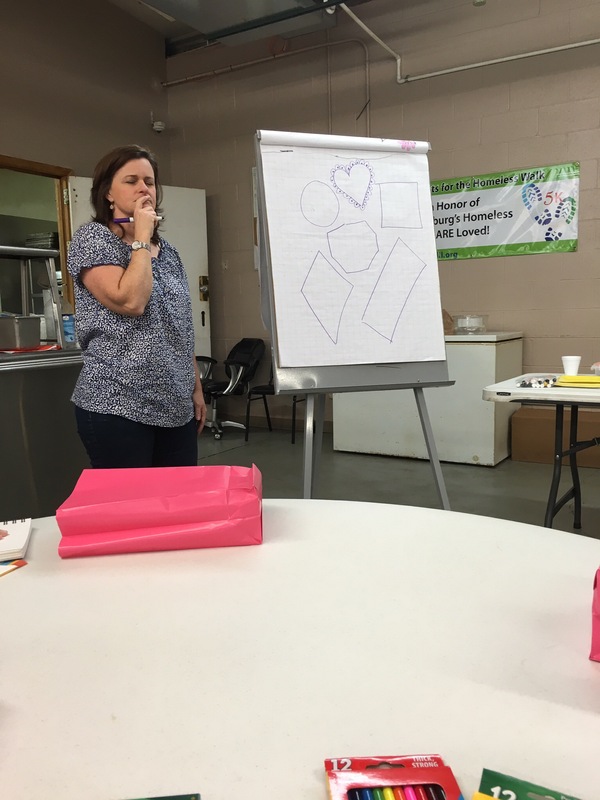 I shared this love of doodling, color and prayer with others and then He took it from there. I failed in the worldly sense, but God doesn’t need my perfection in order to do his work. In fact when I am at my worst, He is at his Greatest!